This week’s Drone Of The Week is the first music I made on my new Modular Synthesizer – thank you, Bellows, for assembling this Thing Of Beauty for me, and thank you, Konny, for help with raising the funds. I recorded it live on four tracks, which I mixed to stereo using my DAW software. Careful, please, mind your ears and loudspeakers. It has a huge dynamic range, and there are some very high energy deep bass notes. Drone Of The Week 46, 2012 (about 5 MB, in the iTunes MPEG 4 format, opens in a new window), Previous Drones Of The Week can be retrieved from the archive. The synthesizer can be called “finished” now. 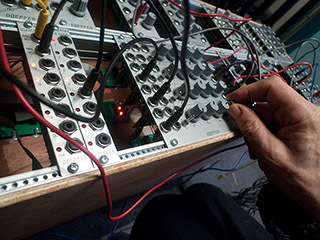 I can use it to compose music, to design new sounds, and to play live… but… are modular synthesizers really ever finished? I look at it as an open-ended development project. Right now, there are still four modules of the initial configuration missing – they are in the post … and next spring, I plan to add some new functionality to it. I have already integrated it into the interface of my Cork City Gamelan sample player, and I can perform on both simultaneously and record the performance on multiple tracks. From December onwards, it (and myself) will be available for soundtracking, installations, performance, custom sound design and also seminars and demonstrations. As a long term goal, I must develop a range of ways and techniques to interact with it which are suitable for people with physical disabilities. This entry was posted in Articles With Music For Downloading, Modular Synthesis. Bookmark the permalink. Wow! What a sound! I love it! Having witnessed the individual items spread out on the table before assembly & then the building of the case & stand it’s a joy to hear this drone emerge from it! All I can say is.. Wow! thanks, Denis – yes, I can make very powerful sounds with it now … but getting there has not always been easy. There are still some changes I need to make to the layout to make playing it physically somewhat easier for me.